So I bought these pumpkin lights last year at Target for around $5 I think. They looked so cute in the box but when I got them home and opened them, I discovered they had a lot of ugly black wire. Yea not so cute. So I decided to spruce them up a bit. I went digging in my craft cabinet for anything I had that was orange or black. I came up with some fabric scraps, ribbon, and tulle. So then I cut strips out of everything using my handy tip I described in this post. And then I just started tying everything around the wire of the lights in random patterns until most of the wire was covered and I was satisfied. It turned out so cute and pretty! And the best part is it even looks great in the day time when the lights aren't on. That is such a cute idea to spruce up the hanging lights! 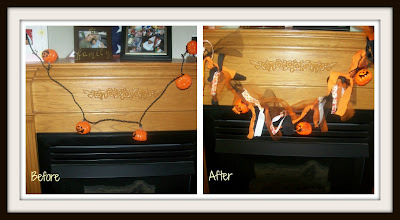 I have similar pumpkin lights...this is a cute idea! They look much more full and festive! Definitely better with your cute additions! Love, love, love how you spruced up the lights! Super cute and creative! Thanks for sharing at the Pomp Party! Pinning! This is great! Now it looks more like a decoration! Thank you for sharing at our Pinteresting Party! Cute! I love this! Thanks so much for sharing at our Pinteresting Link Party! nice! this is like a stroke of genius! you could do this with whatever season whatever lights. Thanks for the ideas! Oh that is so cute! Those lights look great! OH!!! What a great idea!! I'll have to try this!! Such a great idea! Thanks for linkin up!